Wayward Royalty, Introvert, Wild & Free, Stubborn Heart, Story of Prose to name a few are poems playing their own melody of girl power, self-respect, longing and raw truth behind this talented poet/author Kiana Donae in her "Love & Ink Vol. 2: Reflections. She sets the reader's mind in a train of deep thought with an invaluable concept stealthily orchestrated with fierceness and intellect which is celebrated in this book. It's more of a well crafted story with snapshots of how the author sees life and experiences in the wake of her wisdom. This second collection is a continuation of the poet’s passions and life observations. Very similar with the first collection is a chance missed for a great piece of work.This is mainly due to a weak beginning with some excellent poems in the middle that slowly loses momentum towards the end.The beginning has a constant theme of muses that have an editorial feel on topics on black life and sexuality. The sentiments are admirable and agreeable, but do not essentially have strength in words.The structure is telling as there is clutter and full paragraphs. Understanding this to be poetry it has that feel to deter from what you were expecting.However from the poem ‘Fighting to Breathe’ a more traditional structure and poetic verse takes control. Which is not only welcome, but improves the content and in this section the poet appears to be at ease and almost playful.A triumph is the energetic and delightful poem ‘The Enveloping’, which bounces with a musical excitement and appreciation for rhythm.Unfortunately this fuller expression while sticking to the familiar themes started in beginning ends just as the reader is primed for more enjoyment.Better pacing and poem selection will certainly ensure volume 3 shows the full talent of the poet. Moments of magic and some insightful reflections make this an interesting read leaving you waiting for more in all definitions of that word. Kiana Donae's pen being like a parasite took from her very soul the pain, the fear, the joy, and thoughts and blotched it all on paper to create the masterpiece, Love & Ink Vol. II Reflections, which I was given for free for an honest review. Kiana dug deep and let it us see what was in her heart, soul and mind; from current events happening in the world today to events from her own life. I have a few favorites like New Slaves, A Sub Love, Broken Pieces - Part 1 & 2, and the oh so true Hustler, which spoke to me personally. Really, there is not a poem in this collection that I did not like and if you are a true poetry fanatic as I have become because of this series, I am sure you will enjoy it also.Kiana Donae is brave, bold, exotic, and if she lived in the days wild, wild west they would have labeled her as the most revered ink slinger this side of the Mississippi. Now I will end this review with this, when the great Maya Angelou passed away her spirited stayed and know communes with Kiana Donae - may you keep delivering us these wonderful works of art. The more I read this collection, the more I fell into the poet’s world and the experiences she has encountered in love and the society that surrounds her. She has a bold tongue and clever rhyming ability. Some of the poems I imagined being set to music as they seemed very lyrical. Some of my favorites in this collection were Mission: Love, Again, Poetic Tryst: The Beginning, and many others. I enjoyed very much how she alludes to her pen, to the extent that the pen is a part of her persona, whether it be an actual pen or the ink that appears on the screen. Kiana is very passionate and repeatedly displays her emotions and depths, sometimes appearing vulnerable, and other times, she is strong and willing to fight for what she believes in. Very deep, powerful collection of poems. This fabulous second work of poetry does not disappoint! 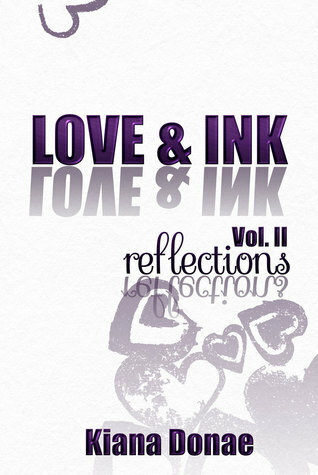 Love and Ink (reflections) will flow right off the pages and into your heart. Rugged soul searching through the gutters of life, and celebrations of the simple joys. Donae is able to bring her readers along for the ride. I love her tribute to the great Maya Angelou, who shaped and inspired so many in her lifetime. Thankful to have read this work and look forward to anything this author spills out in the future with her magical love and ink. In her sophomore poetic book, Love and Ink Vol 2 Reflections, Kiana delivers soul-searching fiery scribes that will leave you in Poetic Heaven. In Reflections, each piece delves into the crevices of the poets mind, heart and soul. She delivers poetry that will not only inspire and motivate you, but captivate and uplift you all while bringing back the love of the written word! And the inspired piece dedicated to the incomparable and legendary Maya Angelou was a beautiful honorary tribute. Truly, Kiana Donae gives us all a reflective and memorable view into all things Love and Ink. I think I liked this collection of poetry even better than the first!